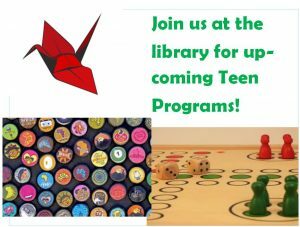 Every month the library offers a lot of fun programs for teens. You can always check the calendar to see what we have going on. Be sure to stop in and join us for some of these events. Come with a friend or meet new friends while you play games, create art and have a great time. Friday, January 11, 2019 from 4:30 to 6:00pm, in the Teen Space! Friday, February 18 from 2:00 – 4:00, in the Teen Space! Friday, March 8 from 1:00 to 3:00, in Meeting Room 2A! Though it’s a snow day at many area schools, the Teen Space (and the library) is open! Come check out a board game, the PlayStation controllers or just find a comfy chair to read your favorite magazine, graphic novel or book, while overlooking the snowy trees lining Elmhurst Road. In Celebration of National Poetry Month! During an April visit to Lincoln Middle School, students created spine poems in celebration of National Poetry Month. Their poems were really cool and even inspirational. Students had a lot of fun making the poems and reading their poems to the class. Click here and prepare to be amazed, as you watch a video of students sharing their awesome poems. Can’t get enough, then how about these photo examples with the verses included. Thanks to everyone who made this a great visit. especially the students who were amazing. This was a lot of fun and I do recommend you try this at home! The summer I saved the world in 65 days chasing shadows. Going over the strange and beautiful sorrows of Ava Lavendar in the mystic city. Going over broken hearts, fences and other things. To mend the fault line the summer I saved the world in 65 days. Chasing shadows hypnotize me. When I was the greatest and gorgeous radio girl, all roads lead to Austen. And the burning sky crashed into you. Scarlet love letters to the dead altered what we saw in the dark. Fat boy! Defy the carpet people before my eyes. A girl called fearless swam that rock across a war tossed sea. Swim that rock across a war-tossed sea. Don’t look back! There will come a time caged warrior. I really liked the feel of this book. Throughout the story it was really easy to connect with Jack and the other characters and get wrapped up in the story. Jack has always felt invisible in his family and when his mother drops him off at his Aunt Mabel’s and Uncle Clive’s for a visit, he starts to unravel the mystery and magic behind why he never felt loved or part of his family, especially when he realizes in Hazelwood he can make friends and people do care about him. Jack is very resistant to this whole idea of magic that the kids he meets in town keep mentions and that his uncle keeps nudging him to read about in book of the town’s history at first. Once Jack starts unraveling what really happened in Hazelwood and how he’s connected to it all things start to get interesting, with Mr. Avery, the richest man in town, who’s also the town bully’s dad, wanting him dead, his and Aunt and Uncle’s house starts talking to him, the nature around Jack seems to be reaching out to him and that’s just the beginning. I really enjoyed Reel Life Starring Us and I think it had a lot of appeal. It’s narrated by two 8th graders, Dina and Chelsea. Dina has just moved from Berkshire, MA to Long Island, NY. At her old school she had lots of friends and never felt like an outcast, but at Rockford Hills Middle School it’s a different story, there are cliques, getting “chipped,” gossip, and more to deal with. Dina thinks she may have found a way to make new friends and be “popular” when she’s assigned to do a project with Chelsea the most popular girl in 8th grade. Through their video project together Chelsea and Dina find out about what’s really important in life when it comes to being a good friend and being true to yourself. It’s definitely not easy to do either all the time. The book touches on a lot of issues that a lot of people are going through now, like moving to a new school, having a parent who’s lost a job, making friends, crushes, and dealing with other the other things that come along with middle school.